So many people and businesses use Google Wallet to facilitate money exchanges or transactions. But did you know you are not allowed to use Google Wallet to sell illegal drugs, like crack cocaine? Yea, true. A fun post a Reddit has one person who sometimes requests money from his friends via Google Wallet. As a joke, sometimes he will include a fun and sarcastic note saying "for my ransom" or "need crack" but this time, Google warned him. 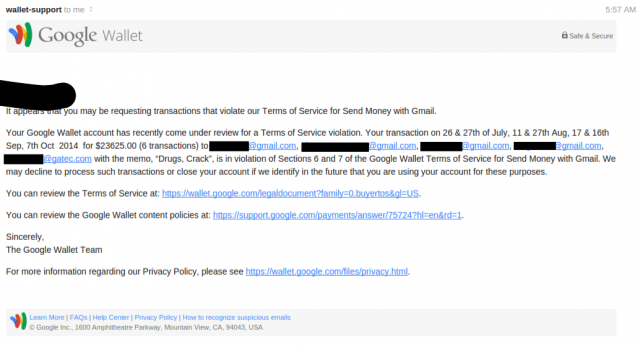 Now his Google Wallet account is under review, because he used the words "drugs" and "crack" which violate the terms of service. So do not sell illegal drugs via Google Wallet. Forum discussion at Reddit & Twitter.